"SOMETHING SHOULD BE DONE ABOUT PROMISCUOUS SHOOTING..."
A small frontier town is being controlled by ruthless mob boss Decker (Lyle Bettger)! 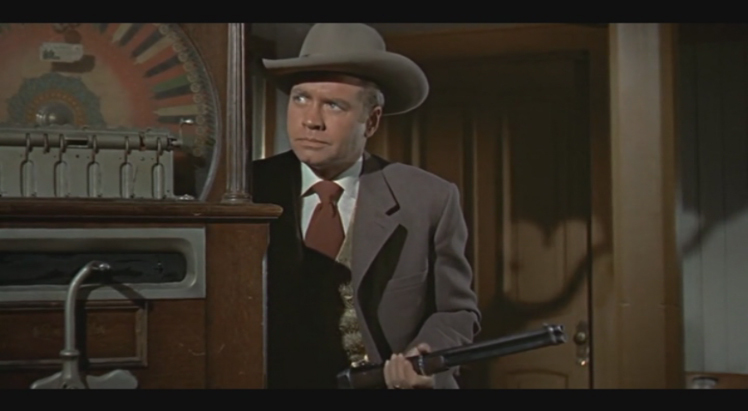 After the local sheriff dies under mysterious circumstances, Decker arranges to have the town drunk (Thomas Mitchell) appointed sheriff, thinking he will be ineffectual. 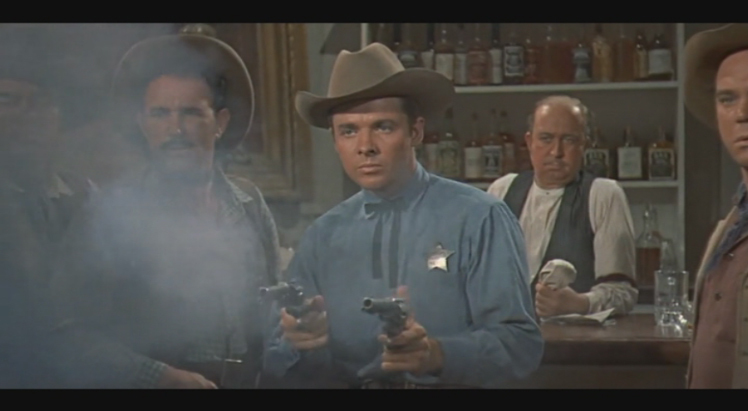 But the new sheriff sends for Tom Destry (Audie Murphy), son of a famous two-fisted lawman, to be his deputy. When Destry arrives, he isn't exactly the swaggering he-man the sheriff had in mind. In fact, Destry doesn't even carry a gun. But the new deputy's mild exterior masks a fierce determination to see justice done, as Decker and the other locals soon discover. We all know that many remakes of successful films are woeful efforts that should rightly be forgotten. 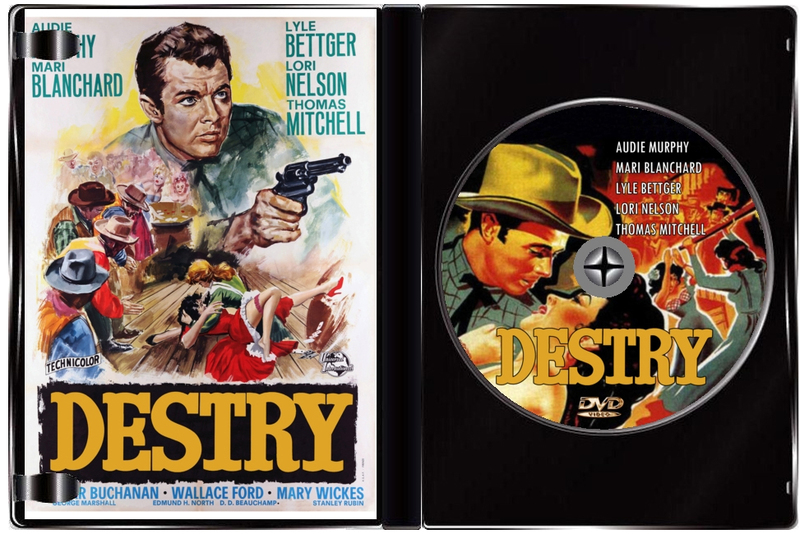 Destry -- director George Marshall's remake with Audie Murphy of Destry Rides Again, which starred Jimmy Stewart -- is one of the rare exceptions! In most cases there is no comparison in acting talent between Murphy and Stewart, but here the comparison favors Audie as he was 100% authentic cowboy and it shows. In fact, Destry was one of Murphy's best performances, but the stigma around the film as a remake has caused it to be unfairly dismissed and forgotten. Lyle Bettger is great in his role as the smooth talking "Bad Guy". Bettger was one of those guys who could deliver his lines with a smile, in almost a mocking manner, because he always seemed to have the upper hand. And if he didn't have the upper hand he was a good bluffer. As for the technical end, I found the directing good, the script devoid of the usual brainless dialog and plot holes that many B Westerns of the time seemed burdened with, and the score was not intrusive. People seem to think this is a comedy, but it is not...it is a Western with humor in it...there's a difference. The humor is derived from the real situations, but never descends into broad comedy with pratfalls and nonsense. 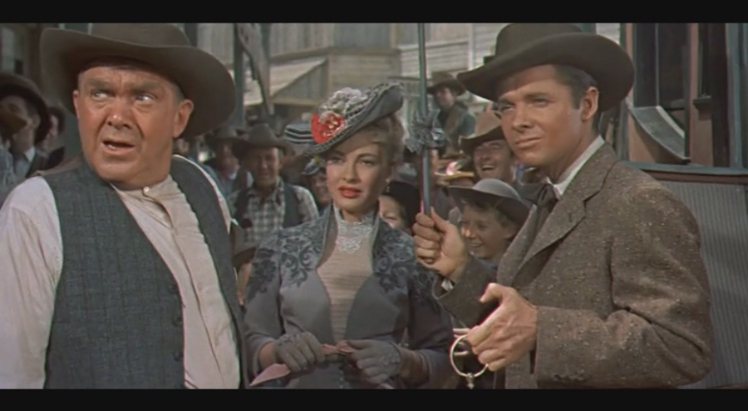 Sometimes remakes do turn out for the best and Audie Murphy was a perfect in the casting of another edition of the Destry saga. 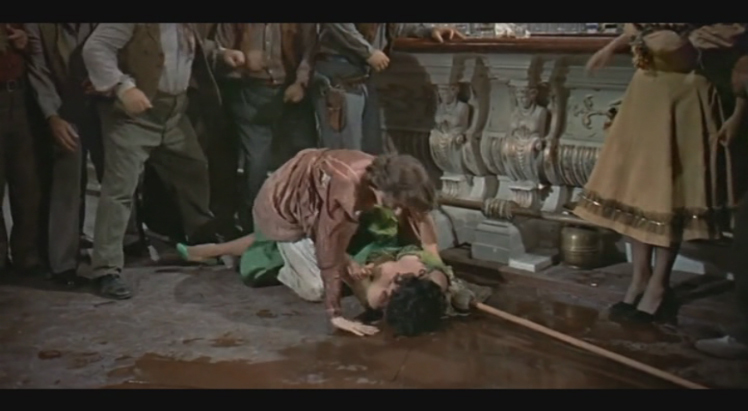 Audie uses some forensic science to clean up the town and the final gunfight is played a bit more seriously than in the James Stewart-Marlene Dietrich classic.